I have thoroughly enjoyed many of Shannon Hale's previous books and looked forward to reading her first foray into science fiction. 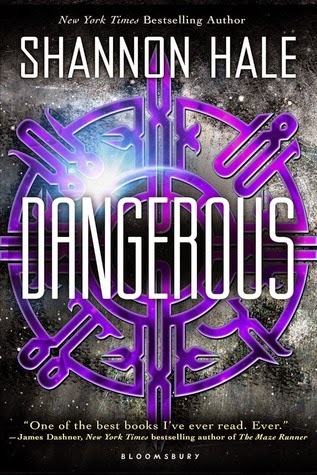 While it started off slow for me, Dangerous improved as it went along and had me on the edge of my seat by the end. Dangerous introduces us to Maisie Danger Brown. (Can I mention how much I love her middle name?) Maisie is smart, particularly when it comes to engineering, mechanics and technology, but is a little socially awkward, in part because she is insecure about being born missing her hand and part of one arm. At breakfast one morning she notices a contest for entry into "Astronaut Boot Camp" on the back of a cereal box and realizing that it's sponsored by Dr. Bonnie Howell, a renowned scientist who had built a space elevator anchored to a space station on an asteroid in earth's orbit, decides to enter. Of course, the space camp isn't exactly what it seems; it's actually a recruitment tool for an alien-token-enhanced team that will defend the world from the bad aliens coming to enslave Earth's population. The beginning felt rushed to me. I wanted more time spent on character development and relationship building. I often re-read a page or two early on because I felt like I must have missed something that connected the dots a little bit more. While Maisie's relationship with her family and best friend Luther were pretty well established from the get-go, her friendships within her team at space camp weren't developed much before they realize the real purpose of their tasks and the action took off. Because those initial building blocks were truncated or rushed, I didn't feel emotionally connected to the rest of the team, which meant that (Spoiler Alert!) their later betrayals and deaths lacked a lot of the impact they could have. And I really didn't get Dr. Howell at all. I think Hale was going for "brilliant-but-crazy-mad-scientist", but she just came across as awkward, odd and clueless. Given that rocky start, I'm glad I plowed through because it got much better as it went along. Once the field of characters narrowed a bit and Maisie's family re-entered the narrative, the character development began in earnest and the action didn't stop coming. The alien invasion took an interesting turn, and the story finished strong with several twists I didn't expect. Definitely worth the read and pushing through the spotty beginning.